CAMEO CONTRASTED OBVERSE! The obverse features exceptional frosted moderate CAMEO devices. Superb spot-free, haze-free surfaces. Locating a 1950 proof Washington with mirrors this deep can be a very frustrating task! The fields are DEEP BLACK HOLES! 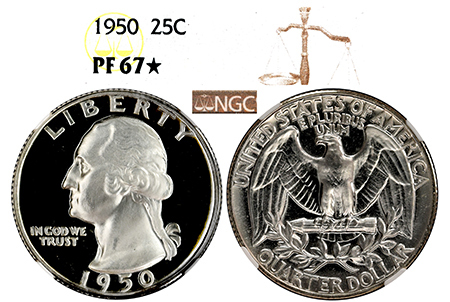 There are 525 examples graded in PF 67 by NGC, and only 24 examples graded PF 67 STAR. Outstanding eye-appeal.